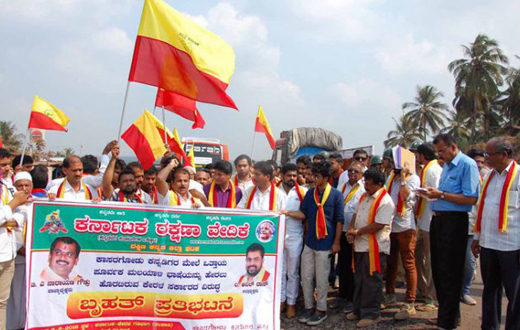 Mangaluru, Feb 7, 2016: The DK District unit of the Karnataka Rakshana Vedike staged a Rasta Roko agitation on the National Highway at Talapady on the border of Kerala and Karnataka on February 6, Saturday to oppose the new Malayalam Language Bill of the Kerala Government. Speaking on the occasion, Anil Das,DK District unit President of the Rakshana Vedike ( T. A Narayana Gowda faction) said any attempt to impose Malayalam on Kannadigas in Kerala would be strongly opposed. Rahim Uchil, District Spokesperson of the Vedike said the border area Kannadigas were not begging alms but were asserting their rights. Several office bearers of the Vedike including Ashok Subbaiah, Madhu, Sudesh Shet, Kerala Kannada Medium Teachers Association representative TD Sadashiva Rao and others addressed the protestors.